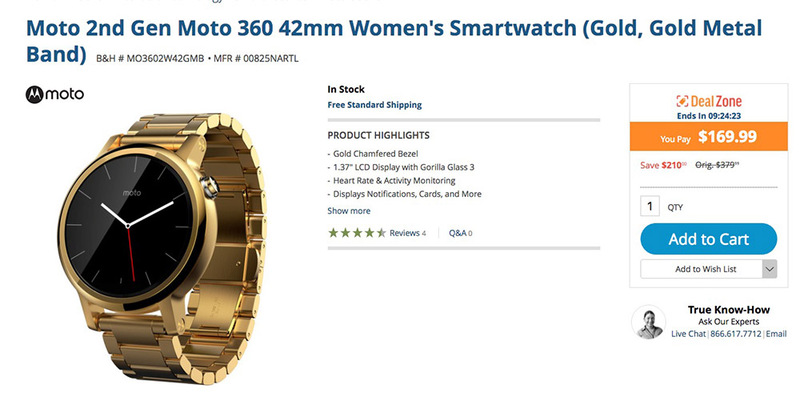 Motorola’s Moto 360 (2nd Gen) is all up in B&H Photo’s Deal Zone at the moment. You can grab Motorola’s Android Wear smartwatch for as little as $169.99 or at a $210 discount. That particular deal is for the all-gold with gold metal band, women’s version that is 42mm in size, but most other models are discounted as well. For one, the all-black with black leather band, men’s 42mm version is discounted to $179.99 ($120 off). You could also get into the 46mm version with gold case and black leather band for $199.99 ($180 off), 46mm black version with black metal band for $269.99 ($130 off), or 42mm with silver metal band for $199.99 ($150 off). There are others, so feel free to jump through that link below to find the model you always dreamt of. Also of note: these are brand new devices rather than the refurbished models we have seen through other deals in the past. Finally, remember that the Moto 360 (2nd Gen) is getting Android Wear 2.0.